A belated thank you for submitting your proposal. Some more specifics would be helpful in terms of the Climate CoLab community and the contest Judges better understanding your proposal. I would suggest that you add information about the level of emissions reductions vs. business as usual levels (either from your own research or working with the Impact Assessment Fellows). Some information about the lifecycle emissions associated with the Mini Elevated cTrains would also be useful for judging the potential GHG reduction impact of your approach. Hello! I&apos;m Parag Gupta, an MIT Climate CoLab Catalyst. Thanks for your proposal, but I am not seeing a lot of detail here. Dr. Kumar may well have done some research in the area, but I would encourage you to cover some of the points noted by Jeff above. I think you are best served to address the design in more detail with drawings, etc. that differentiate your idea from many of the other mass transit options. Also, economic feasibility studies would help your proposal considerably. Are there any quantitative assessments that you or others have done comparing your power source needs, GHG reduction impact, design features, etc. with other mass transit proposals? Good luck! Thank you for the feedback. The research questions you posted are very important and we would like to work with the Impact Assessment Fellows. Can you suggest someone? Some of the questions such as required energy use, emissions, and others can be estimated by extrapolating from the core design feature. I am also adding a brief overview showing what is novel in the cTrain concept and how it is superior to other forms of elevated transport known to date. - supported by arched structures connected across opposing sidewalks. Arches are based on regular concrete poles and connected across sidewalks. Arched supporting structures allow for minimal thickness which further helps reduce the visual impact on the urban landscape. - travel both above and below the tracks - further reduces visual impact by using the same set of tracks in both directions - this feature also allows the cTrain to be positioned the furthest away from either side of the built environment on a street or avenue (thus less opposition from those who own properties on that avenue). - Other unique features provide quick and easy access to seats - minimizing the time required to stop at a station to approx 5 seconds. 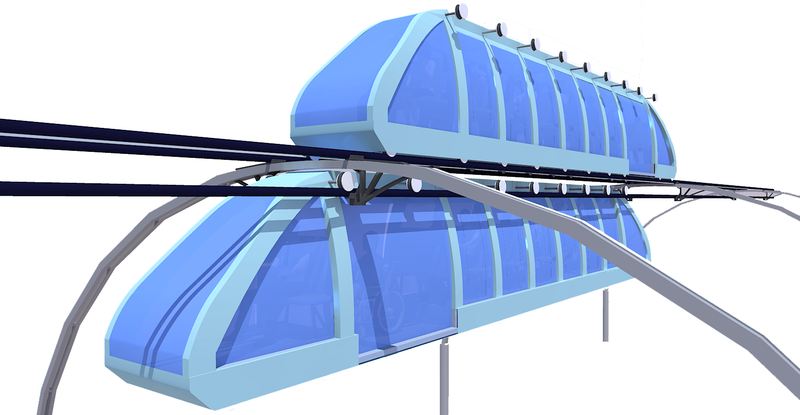 Below are a number of recent articles about our mini elevated cTrain concept which is designed to transform mass transit to run entirely on renewable energy as well as provide complete solutions to all the shortcomings of mass transit models to date. Can you please review the images and text that I added and send any feedback you have. The cTrain model can be adopted on a comprehensive scale to meet all six requirements below - and powered entirely by renewable energy. With sufficient advocacy and public awareness of what is possible, the cTrain model - or other forms of elevated & automated mass transit - can be adopted as a global convention requiring signatories to ensure adequate transportation both as a human right and tool against poverty as wells a a means to combat climate change. If the above idea moves forward, by 2020 a blueprint for a standard model can be adopted worldwide with agreement on standard structural and modular parts for easy manufacture and assembly as wells as standard software and related electronics. As such the cTrain would be cost efficient. Similar standards are have been adopted for the World Wide Web and other areas. In the same way the cTrain can bring a standard that would make mass transit as cheap and effective as possible - and nearly free in the way that the WWW is "free". By 2040 all cities and nearly all settlements may have the cTrain in place. The idea of not being able to move easily anywhere within a city (and between cities via other mass transit) will become as ancient as not being able to move data from one place to another. While the comparison of moving people versus moving information may not be analogous it is relevant however. Without the WWW we did not have the ability to move data easily - in the same way without the cTrain we do not have the option to move dozens of miles across populated areas in a matter of minutes.By 2050, after about a decade of the cTrain fully functioning in all populated areas, and powered entirely on renewable energy, the greenhouse gas emissions we have today from commuters by car and by polluting mass transit is eliminated. Would I be able to add more images so voters can have a better idea about the concept? Or is it closed for editing at this point? Hello! It&apos;s Parag Gupta again. I am actually not sure of the answer to your question. By the way, I only came across your question because I clicked on the comments section by chance. I would suggest you send your query to the contest directors directly. Good luck and congratulations on becoming a finalist! Dr Kumar - great work and exceptional idea ... I hope the very best for you and your team. This looks like an amazing idea perfectly matching the requirements of modern public transport. Seems like an ideal design for metropolitan areas with high rise buildings and less free spaces. 1 - Each corner structure to get people to the c-train needs space both at ground level and above ground by the train, which might not be doable in a place like Manhattan where buildings go right up to the sidewalk. 2 - Keep in mind that some areas and times are more heavily congested than others. Major roads for cars and pedestrians will probably still have more demand for trains and more trains will still be needed during rush hour. 3 - Trains meeting at every intersection will also cause traffic problems as trains need to pass through the same space, similar to the cars on the street below that need to stop for traffic lights and stop signs as opposed to being able to cruise on a highway. Having trains pass above or below each other would alleviate this traffic problem, but might be a structural issue to run trains the additional height. This added height will also be needed where streets cross each other on bridges instead of meeting (such as around highways). 4 - If every street has its own train, passengers may need to change many times to get to their destination. Each change is added stress. It is why some passengers choose to take one train and have a longer walk than to change trains. It is probably more realistic to have trains covering major roads instead of all roads, or every 2-3 roads in places like Manhattan where every road might be major. This will also minimize how often trains need to stop (added time for each stop), as well as how often they intersect. 5 - Keep in mind that parents with young children use strollers, which will likely need to be transported in the handicapped space due to size, yet the parent needs to stay with the child. Some families might have more than one stroller, depending on the age and number of kids. You will also need to worry about school groups where a group of children need to be supervised by only a few adults, so a grouping of 2 or 4 wouldn&apos;t work. Thank you for your feedback and we appreciate all questions and suggestions. Even if some solutions are not in place yet we go on the premise that solutions will be found as we progress. Please see my answers below, as I can best evaluate the solutions at this point. I agree that this is a challenge but I think in most cases it can be resolved. Though it would require the space of at at least 1.5 parking spots to accommodate the stairway and the elevator. 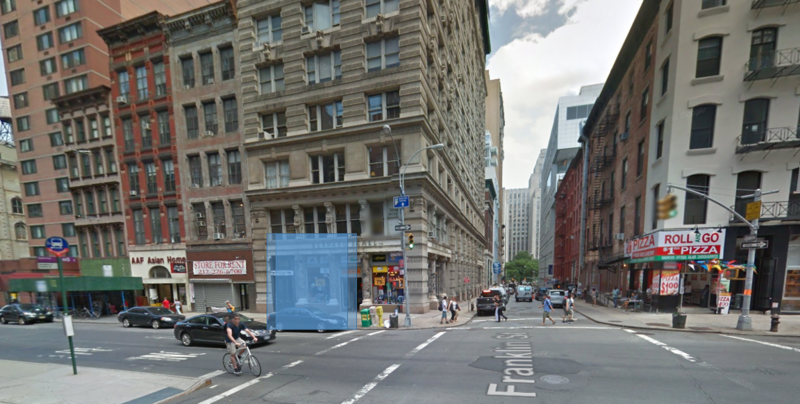 For example at the corner of Broadway and Franklin in Manhattan it would take the space of the blue area marked in the image below (from Google maps). This would require some rethinking of usage of some parking spaces but not entirely. Currently there is a trend to create more pedestrian space by expanding the sidewalks before intersections by about one parking spot or so. Looking at a map of Manhattan by adding a cTrain on all major avenues and streets the cTrain can easily replace all buses and provide the service at a fraction of the cost at a far greater capacity. I believe the cTrain can also replace at least a number of the subway lines and provide superior service while freeing up the subway stations for commercial space use which would bring revenues to the city. We chose having the lines intersecting rather than stacking them. This helps avoid visual blight on the city and also make it easy for passangers to change trains. The crossing of the trains at intersecting lines would be handled by algorithms. Keep in mind that at the peak times there is a cTrain at every 10 seconds at the most, and they would stop at the intersections anyway because because these are also stations. The crossing would take about 2-3 seconds at the most. Unlike cars The cTrain would intersect at only at about every 300 meters or so in a place like Manhattan which means far fewer intersections. Also, each cTrain would carry the number of passengers of at leas 10 cars. The cTrain would not be on every single street but only every 4-6 blocks so that it can be accessed within 2-3 blocks at the furthest. The idea of changing cTrains is very different than the traditional way we think of changing subways which is stressful because of the long walk through heavy crowds and often long wait times. These problems are eliminated with the cTrain model. Changing cTrains is more like changing (horizontal) elevators. It only takes about 10-20 steps to switch from one train to another. In most cases the passenger will need to change three times maximum to come within 2-3 blocks to their destination. It still is superior service to buses and subways. In the design I am showing each cTrain has four seats for stroller access in the handicapped spot (the space of the opposing 4 seats fits two strollers comfortably). Research will be needed to determine weather this space is sufficient to meet the need or weather more than one out of ten passengers needs the handicapped/stroller accessible seats. The grouping of more than four children needs to be thought out but I think there are ways to meet this need. For example, the system allows users to reserve a full train which means a teacher can get on one train with all the children and request a particular destination stop. This way the train will only stop at the destination and not along the way. The cTrain still allows for easy supervision, though not for accessing the seated children - not unlike when driving children in a van. I think this model would be more effective than if the same teacher would instead need to get with 20 children on a crowded public transit bus or on a subway. Thanks again for your questions and suggestions and I look forward to more feedback. Thanks for voting for my proposal. It is very much appreciated! With more available electrical energy, your transportation system would further reduce greenhouse gas emission! I voted for your proposal! I really like the idea of cTrain. First, according to its design, it minimizes height of trains (via sitting room only) as well as the width in order to save a lot of energy which may lead to climate change. Second, it is so amazing that the trains are able to travel both above and below the tracks, enabling to bring the largest amount of traffic volume. Third, the tracks are designed as arches so that they can fit on the streets with sidewalks. In addition, I agree that we need more convenience for passengers – I find out that all passengers could easily get on and off the train rather than wait in line. As well, there are some doors provided for wheelchair access. I love the conclusion terrautopia made about professional people this project involve, such as civil engineer, architect, computer programmer, and most importantly, all people are welcomed to give comments and suggestions. That’s why this project is a citizen science project. A belated thank you for your support and insightful comments. Please feel free to forward to others that are interested in solving urban mobility / public transit. I would greatly appreciate all feedback. What is the turning radius of your tracks? Most modern mass transit systems have long spokes that reach into the suburbs. Would you consider such a model? Hi Paul,Turning is challenging.The cTrain model is design to go over any road and certainly would connect the suburbs as well.Thank you for your feedback!! !